The SH 2000’s proven hot-air technology eliminates the need for traditional sealing bands on most plastic bag sealing applications. This new generation of hot air sealer features the latest in PID temperature control, an innovative direct-drive system and a 20 percent greater heating capacity for sealing flat polyethylene bags and pouches. Using ambient air flow technology, the SH 2000’s secure hot air seal is the ideal solution for a wide variety sealing applications that include the food, medical, pharmaceutical and chemical sectors. The SH 2000’s comes standard with a, stainless steel housing and is engineered with a variable speed drive system, easy to use controls, motorized sealing height adjustment and an automatic over temperature sensor shutdown. The standard SH 2000 creates seal widths from 6 to 9 millimeters and is available in a right to left or left to right operating direction. Available options include additional PID temperature controllers, bag top trimmers, bag top cleaner, air-purge cabinet and embossing coder. Other models include medical validation, wash down and conveyor integration. 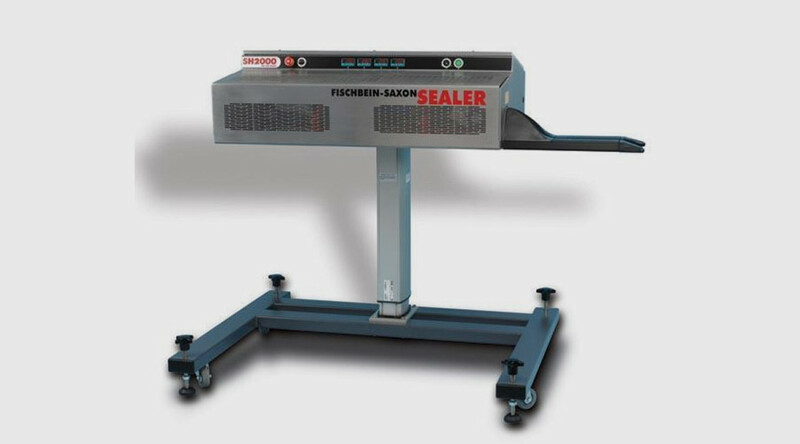 The compact SH 2000 hot air sealer confirms Fischbein-Saxon’s supremacy in hot-air sealing technology. Engineered for fast changeover, less down time and increased productivity, the SH 2000 is a smart solution for your bagging needs.